The lines between work and personal lives in the city are blurring, according to staffing and human resources consulting provider Randstad. With detailed feedback from 405 local employees, the new survey – part of their debut Workmonitor Report for Hong Kong – captures sentiments towards local work practices. 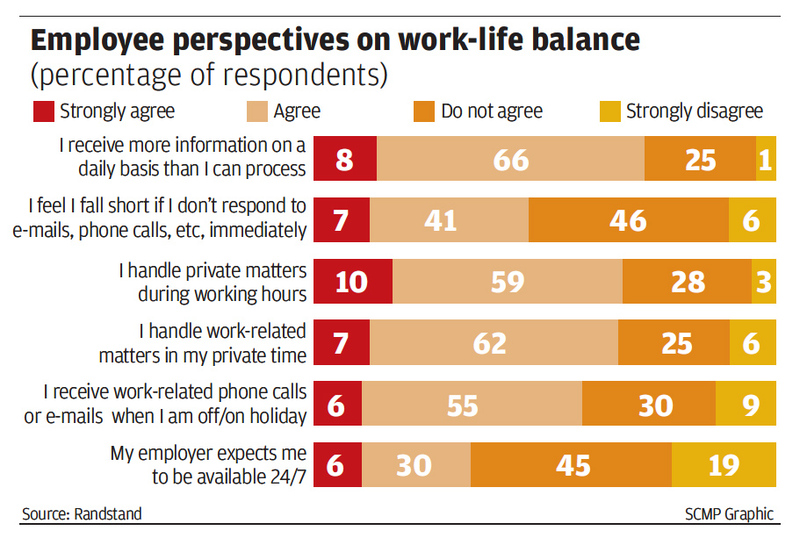 Of those polled, 36 per cent said their employers expect them to be available at all times, while 61 per cent reported receiving work-related phone calls or e-mails during their time off. Commenting on the results, Brien Keegan, director of Randstad Hong Kong, says that they have done similar surveys in other countries, but a notably larger proportion of local respondents claimed to work outside office-hours, a fact he attributes largely to the city’s role as a financial hub. The survey also showed that 69 per cent of the respondents said they tended to deal with private matters during work hours, while 68 per cent indicated they handled work-related matters in their private time. Keegan believes that to counteract this “blurring”, staff and employers should set guidelines defining priorities. “The balance between working and living is really an individual preference, so employees and employers should set boundaries and expectations and find what is personally and professionally important,” he says. Keegan notes that striking a balance between work and life commitments can be a good thing for both workers and their managers. Flexible working arrangements, he adds, can increase productivity, aid employee retention and enhance staff engagement. Nevertheless, Keegan concedes that flexible arrangements are not for everyone. “While some part-time workers might give 40 hours of work on a 20- hour timesheet, other employees need the routine, support, guidance and social structure of a traditional workplace,” he says, adding that this may explain why 65 per cent of respondents also indicated a preference for face-to-face contact.